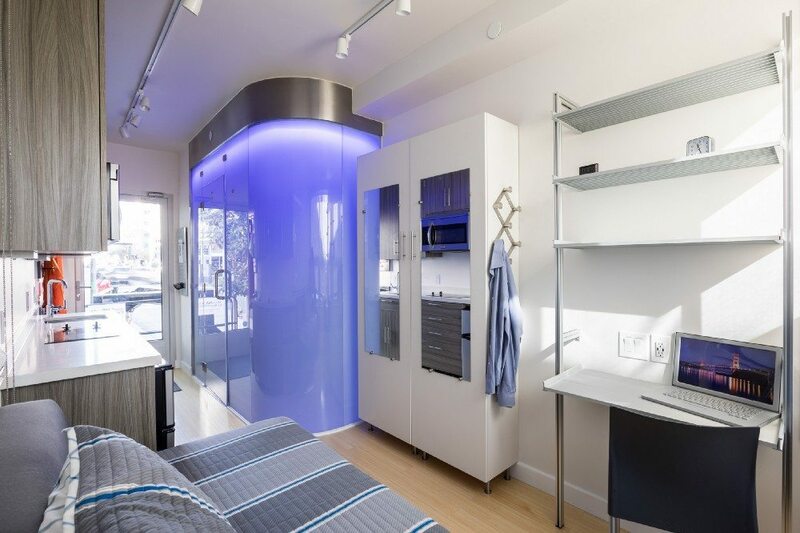 Is Micro-Unit Housing A Solution To California's Housing Problem? A for-profit developer believes prefab micro units are the solutions to California's housing crunch. The micro units are 160 square feet and stackable. As housing prices continue to rise, the issue of how to house homeless and lower-income individuals and families becomes increasingly important. Many cities are planning or enacting legislation to fund these projects and pave the way for faster development of affordable housing projects. Microunit housing has been floated as a potential solution for years. One developer, Patrick Kennedy of Panoramic Interests has a proposal: small, stackable prefab modular units he has called MicroPADs (the PAD stands for “prefab affordable dwelling”). Kennedy and the Panoramic Interests team developed MicroPADs after building 23 295-square-foot units at 38 Harriet Street in San Francisco. The units come in groups of two and measure just 160 square feet each, with space between the two dwellings. They come complete with a bathroom, kitchen area, bed, desk and closet space. Units have a drain in the floor as well as a blacklight under the bed to help combat bedbugs. Individual sets of units are designed to be fit together and stacked on top of each other to make buildings. The facade, roof and common areas are finished on-site. Kennedy says they can be delivered in about half the time and at 30 percent less cost than traditional buildings. Kennedy has stated that he has a goal of bringing 5,000 units to the Bay Area each with a per-unit price of $1,000 to be at least partially subsidized by local government. However in San Francisco, Panoramic Interests’ home city, local government has turned down a proposal — partly because the units are built in China. Some locals also took umbrage at the fact that Kennedy is a for-profit developer seeking to put his units on city-owned land and collect per-unit rent. Others declared their support for the initiative as a potential answer to the fact that the city is running out of SRO (single-room occupancy) units to transition people into. A MicroPAD unit was recently on display at Sacramento City Hall. The city convened a city and county joint meeting after three homeless people died on the streets of Sacramento. Hundreds of people attended the meeting and listened to various proposals, including changing public housing plans and finding new ways to allocate hundreds of public housing units for the homeless. The Berkeley City Council has been reviewing the units as part of its initiative to provide supportive housing. The city’s proposal doesn’t mention the units specifically but does call for 100 units to be built in an expedited matter, a request that aligns with the proposal from Panoramic Interests. If Berkeley identified a lot or space, a four-story, 100-unit building could be developed for $20 million to $25 million. That works out to $200,000 to $250,000 per unit, a number that is about half the price of traditional supportive development in San Francisco. Meanwhile in Orange County, a prefab apartment building of 480-square-foot units is due to open soon and will be the state’s first multifamily housing made from shipping containers. The 16-unit project was completed in under 5 months and will be home to 15 homeless veterans. The 16th unit will be occupied by a case manager, who will coordinate services for the veteran residents. As those who have worked with the homeless know, housing is just part of the problem — counseling and support programs are also needed for optimum success. However, without housing other efforts may not gain enough traction, which is one reason that as Sacramento examines its homelessness concerns, it decided to start with housing. One problem with the MicroPAD units and other small units is that they are suitable for individuals and not families. Other solutions would still be necessary to deal with the increasing number of homeless families — but as Kennedy and others advocating for the units say, at least it is a place to start.